Daily Nutrition Weight Gainer (Chocolate Powder) 250g is a true champion grade formulation with more body building protein; vitamins, minerals and amino acids than most other weight gain powders. Ref. Sports Ref. Sigma Series - Blue,Green. Other Jabulani Football - Multi-Colors. Playing sports in the right position and with the right equipment is as important as the activity itself. Browse through Jumia Uganda to get the perfect equipment for the sport or exercise activity of your choice, be it baseball, yoga, weight lifting, simple workout or indoor games. Search to discover a wide variety of the Ugandan team branded vests and get to represent your country proudly in any color of your choice. Shop your yoga fitness mat in your favorite color and you never have to be out of tune with your inner self. Get a relaxing body massager for your after-sport relief. Also, order muscle tone supplements to help build your muscles alongside your regular exercise. Still trying to attain that health goal, shop for your preferred sports equipment and accessory and start exercising. Explore our collection of tummy trimmer fitness kit and keep a date with your work out in the comfort of your home. Shop medicinal supplements that can help relieve your muscle pains like the kinesiology tape, muscle tech creatine, elastic ankle support. Are you a soccer fan, order for your authentic soccer boots at affordable prices. Also, shop your preferred sports jersey online in your favorite color and design. Get the total body workout system that features working out on the arm, shoulder, back, and thigh. Our head & scalp wire massager helps relax the head and neck area muscles, enhancing circulation in those areas. Remember to include a skipping rope to complete your exercise kit. Get other amazing sports accessories like the pedometer that helps monitor your heart rate. Do not forget your favorite indoor games to keep your brain sharp and relaxed. Shop for your scrabble set, chess set and a whole lot more. For your outdoor sporting activity, browse across selections of golf balls, tennis and badminton racket, Barclays football, boxing gloves, Spalding leather basketball, Mikasa volleyball, and bicycles. 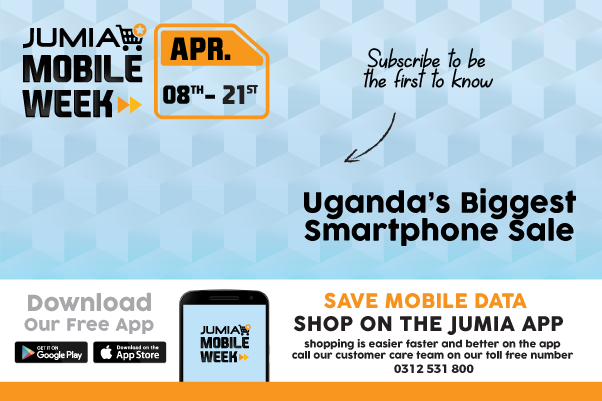 Shop online on Jumia Uganda at affordable prices with just a few clicks of your mouse. Use any of our safe and convenient payment methods and have your sports equipment delivered to your doorstep.